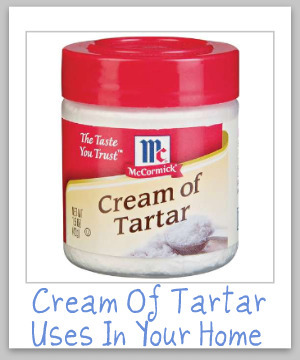 Below you can learn the answer to the question, "what is cream of tartar?" and also cream of tartar uses for around your home for cleaning, stain removal, and fun uses too. I have seen lots of homemade cleaners recipes which suggest using cream of tartar as a one of the ingredients. It got me to thinking, "what is cream of tartar?" Cream of tartar is also known as its scientific name of potassium bitartrate. It is an acid salt, meaning that when it is dissolved into a liquid it will lower the pH of the liquid. Cream of tartar is a natural by-product of wine making. Cream of tartar uses for food include being an integral ingredient in some baking powders, along with many other baking uses, but that is not the subject of this article. Instead, this article discusses the uses of cream of tartar for cleaning, stain removal, and other household uses not related to food. Generally, cream of tartar is used to clean and remove stains because of its acidic properties, but other times it is also used for its mildly abrasive qualities. Generally, the cleaning recipes I have seen which use cream of tartar as an ingredient are metal cleaners, such as for aluminum, brass and copper. For example, you can make a paste of cream of tartar and vinegar (or another acid, such as lemon juice) which is great for buffing and cleaning many metals. You can, as one reader did, even use it by itself to clean up metals. (Please note some people expect when they combine cream of tartar and vinegar that it will bubble and fizz, like when you combine baking soda and vinegar, since cream of tartar and baking soda look similar. In addition, you can boil a solution of 2 tablespoons cream of tartar, 1/2 cup vinegar or lemon juice, and 1 quart of water in a metal pot for ten minutes to help clean it. Combine these ingredients together and place in a large container, with a cover. When you are ready to use it pour a couple of tablespoons of the powder onto the cookware and scrub with a nylon scrubber which has been slighly moistened with water. Once the pot is clean rinse well and dry. You can also use cream of tartar to clean stainless steel sinks, pots and pans. 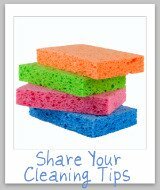 See a recipe for homemade stainless steel sink cleaner here. Further, you can use cream of tartar, along with aluminum, to make a homemade battery which can clean silver. 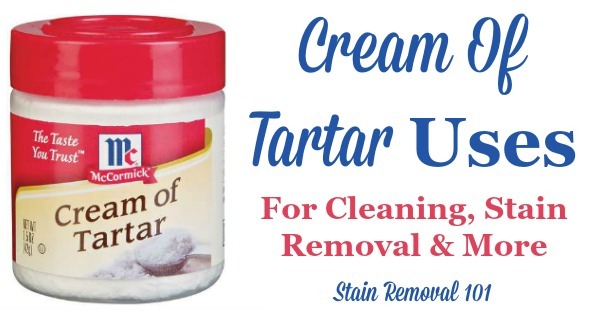 In addition, another of the cream of tartar uses is for stain removal. This site isn't really about homemade crafts and ideas for your kids, but I just couldn't resist showing you this video. Did you know that another of the uses for cream of tartar is as an ingredient in homemade play dough? The cream of tartar is used in a similar way as when used in baking, to keep crystals from forming in the dough. In most grocery stores you will find cream of tartar in the spice aisle, but it comes in a tiny little container like the one pictured above. If you buy it in such small quantities you will run out of it very quickly, after one or two recipes. Hope you use and enjoy these cream of tartar uses for around your home, with this neat little spice from your spice rack.